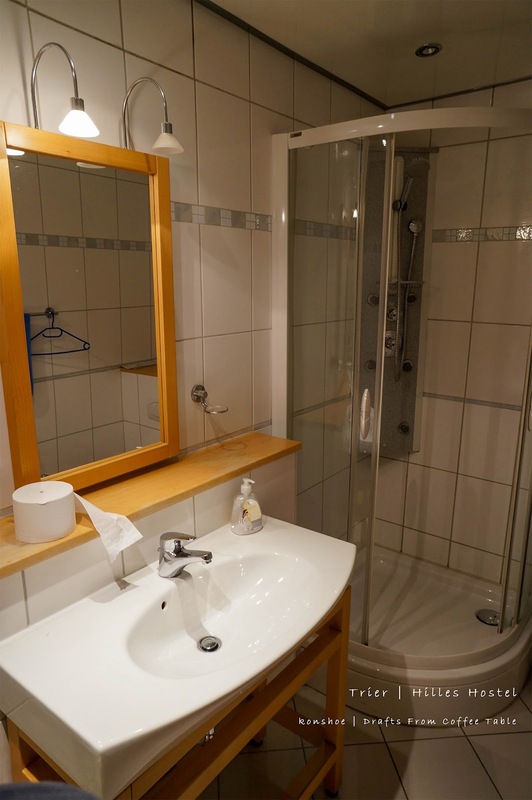 Note: This article was written base on experience of staying in Evergreen Hostel's (previously Hilles Hostel) Single Room without private bath. The following info is important to you because it tells you on which month we stayed, and the price relative to the amount of time between the date of stay to the date of booking. You may experience higher or lower price at different months/seasons and if you book further or nearer to the date of stay. Evergreen Hostel (previously Hilles Hostel) was a random hit when I surfed the net in search of an accommodation that was economical and close to both the train station (because I arrived at night and was not confident of navigating the streets at night) and to the major spots that I wanted to visit (the Roman ruins, what else). It came with mixed review though so I decided to try my luck since it was not like I will stay in the room for long anyway. 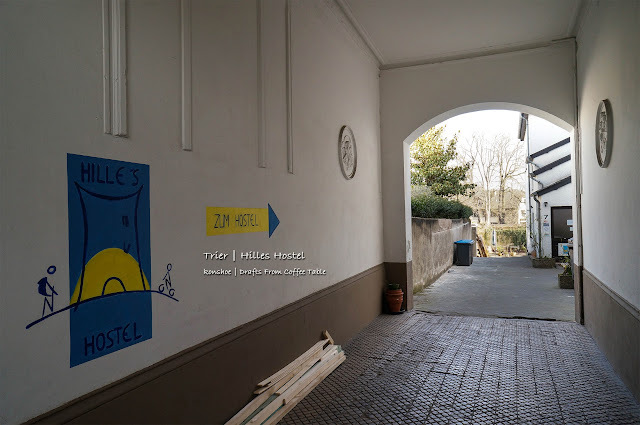 The front of the hostel entrance - the sign was quite small and easily missed unless you were looking for it. 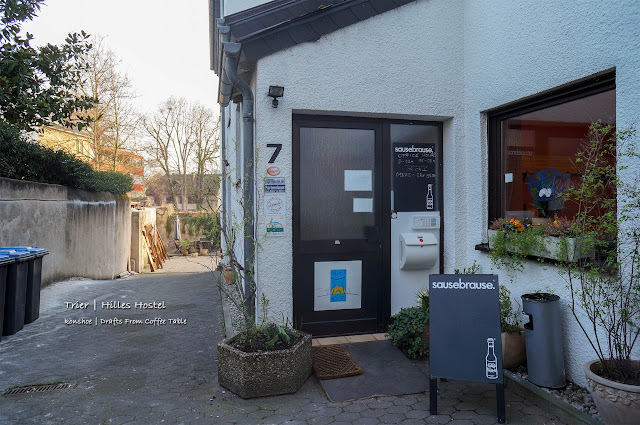 It had a rather unassuming front, to the point that I missed it a few times when I first tried to find the place after disembarking from Trier Hbf. 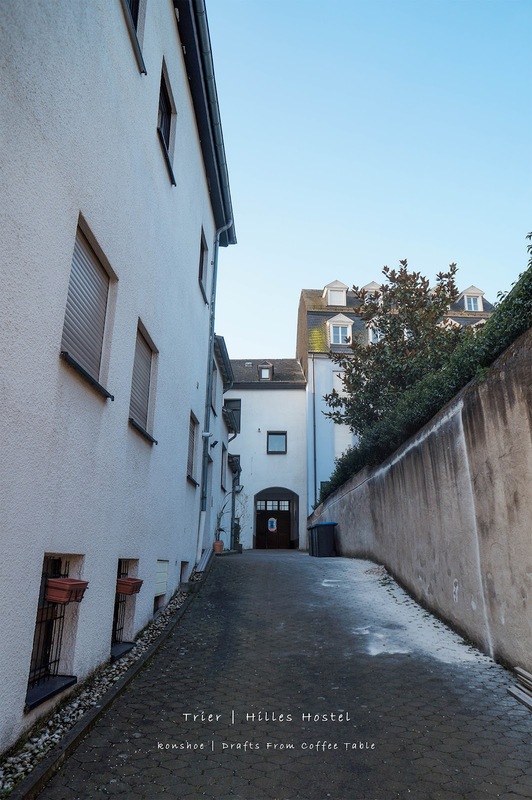 In fact, the front door led not into the hostel building but to a moderately spacious compound with an elongated floor plan, on which of course sat the hostel building itself. 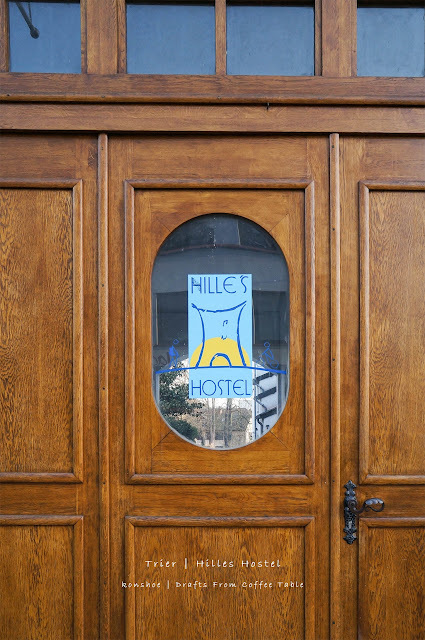 There was of course a poster sized print of the hostel’s name and logo on the front door as well as the usual metal sign jutting out horizontally over my head, but they were quite inconspicuous compared to the surrounding shops. 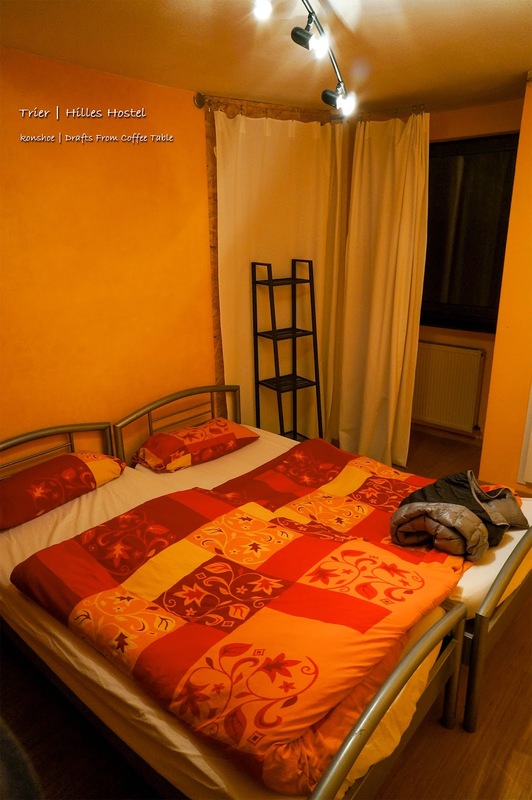 One would hardly expect that a hostel was hiding in plain sight. This was the view after stepping past the front door. The hostel building was actually past this corridor and the compound. THIS is the hostel itself. It is a 3 story building and mine was at the top floor, so I got to exercise my muscles everyday. The large window to the right was where the kitchen occupied. Walking past the building through the path on the left led me to a moderately spacious area that acted as a beer garden. If you are part of a large group you can enjoy yourselves there. 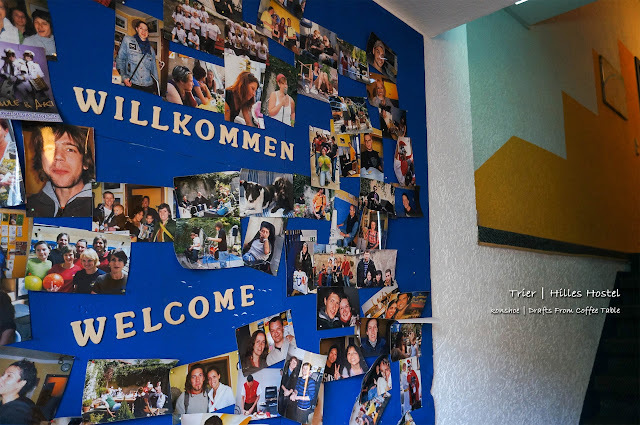 The hostel was unstaffed most of the time, curious even for a budget accommodation. Its operating hour was unusually short and the whole place almost ran by itself. I arrived at night (not so late though) and informed the staff beforehand, so he left the key to my room at the lobby and the other guests helped point me to where it was (actually it was hanging in plain sight, I just didn’t know where to look for it). Since no deposit was made, I only paid in full the other day when the office opened for work. The management sure trusted their guests explicitly. I reserved for a private single room (yes, I am quite private and stingy at the same time) with shared bathroom, but was given the keys to a private double room (with 2 single beds), which was nice. With a moderately spacious room to myself, the bathroom right across the hall from my room and no other occupants sharing the same bathroom on my side of the hall, one can say that I got quite a bargain out of what I paid. A better heater system would have made my stay better since theirs was not starting up fast enough, and their Wifi coverage was very weak – I could get no connection at all at the 3rd floor. I was prepared for this since I had read about it in other reviews before I chose to stay there so I prepared some books to kill time but I can imagine the frustration of uninformed occupants trying to get connected. Their Wifi connection was much better at the kitchen area though. My room - although I paid for a single room, only a double room was available, which was fine by me - more space for the same price! It wasn't exactly a large space but still more than what I would get elsewhere for the same price and location. I get to sleep in whichever bed I liked! The bathroom was just across the hall from my room. Each floor was roughly divided into 2 areas, with the stair landing dividing them up. In each areas the rooms were connected with hall/corridor, and only my room was occupied in my area. So basically the "shared" bathroom just became my "private" bathroom. The lighting was not working fully though, and only the 1 light above the basin could be switched on. Anyway, it wasn't like I need to see clearly to wash myself. The view from my room on a morning. Not exactly a nice view but not too shabby either. I could see the clear sky since neighboring units weren't too tall. The hall at the stairs landing at my floor. A wall of happy faces of past occupants decorating another staircase landing area. This area is the hall right after I enter the building. 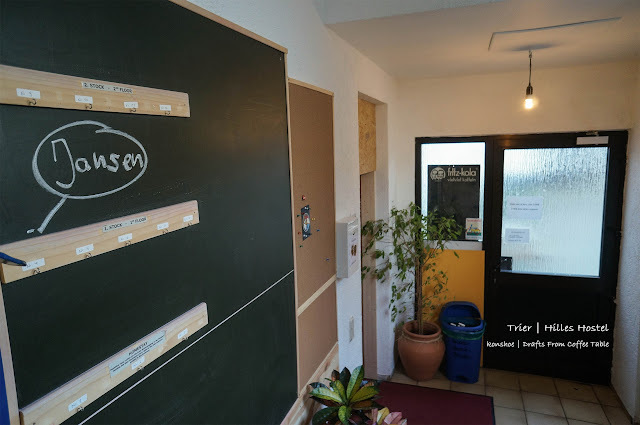 The keys were hung on the blackboard on the left for late arrivals since the office would be closed at night. I did not use their kitchen except for boiling some hot water but it was clean and well kept (as long as the previous group tidied it up – remember, the place almost ran itself). It was not exactly a spacious area so large gatherings could be quite difficult. On the other hand, Evergreen Hostel did have a spacious compound that could act as a beer garden if the weather was nice. The kitchen area was not too spacious but quite comfortable for chit chat or to get hot water. This area was one of the best Wifi coverage area so you might be fighting to get a spot here for connection. Utensils and ovens for preparing simple meals. The view from the back of the building to the front entrance from the main road. 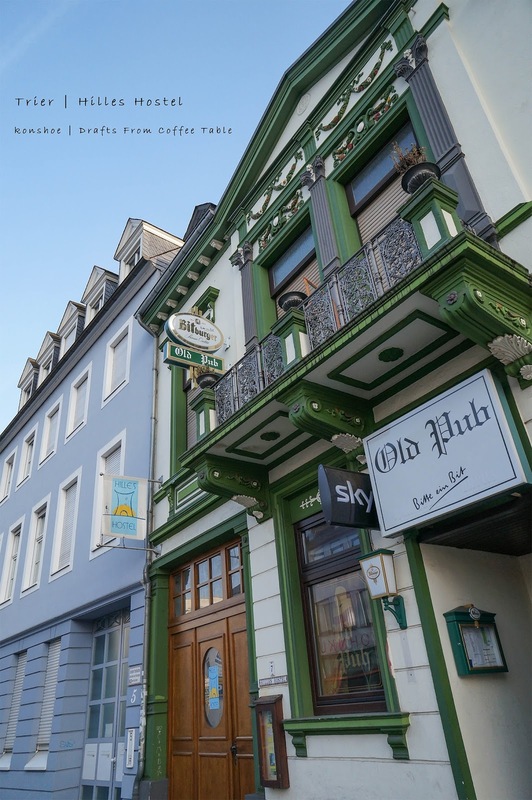 Its location was quite strategically placed – close to the nearby major tourist areas and also to the residential side of Trier, which meant that a supermarket was just around the corner and food/good easily purchased. I also wandered around the quiet residential neighborhood on my last day to see the other side of Trier, free from the tourists who roamed the center of the city. I definitely approve this location for budget travelers who love wandering off the beaten path yet still able to get to the major spots in the shortest walking distance. 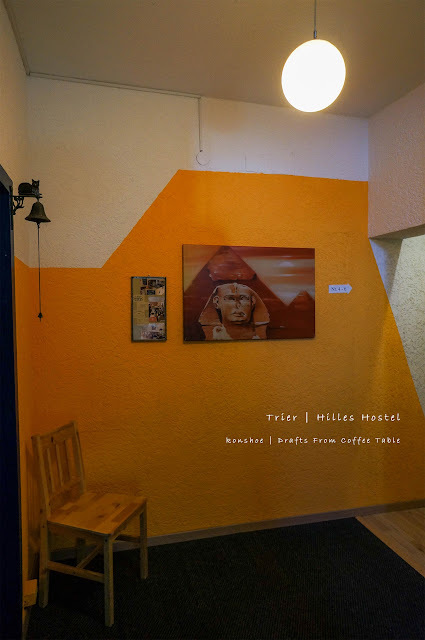 However this would not be a suitable choice for first time budget travelers who were not used to a hostel with little amenities and staff support. 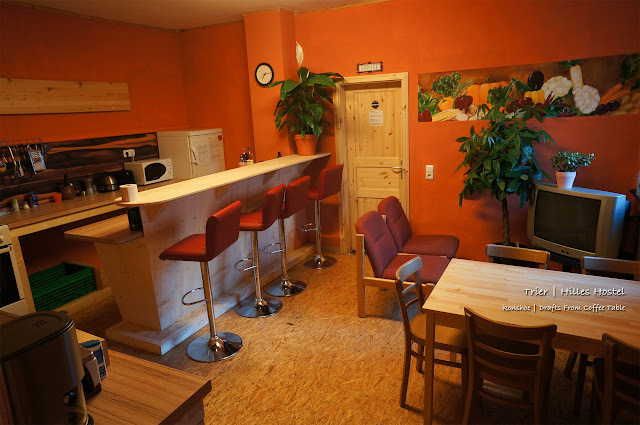 Do keep in mind that Wifi coverage is bad, so if you are addicted for a connection, you should head to the kitchen area to get connected. 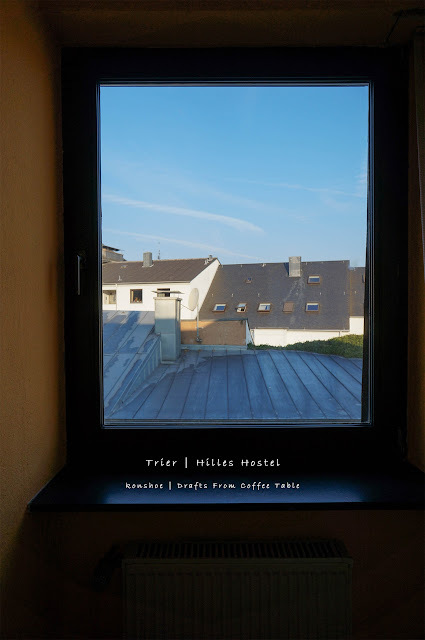 I had dallied in posting my trip to Trier until after 2 years, so the experience may no longer be the same. 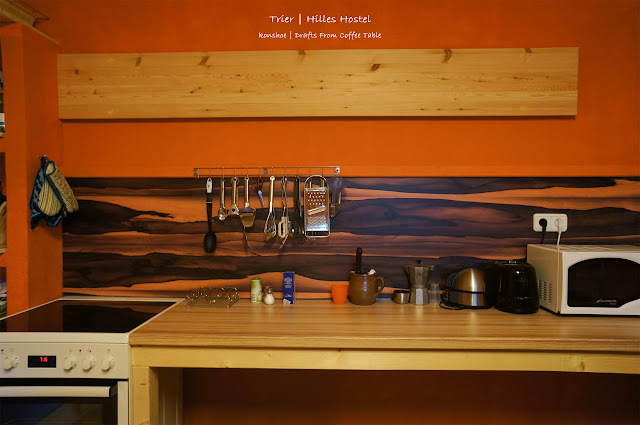 The management has changed the name from Hilles Hostel to Evergreen Hostel, but from the photos it appeared that not much has changed since then. The price is also similar to what I experienced 2 years ago. Check-in time: after 3.00 p.m.
Check-out time: before 12.00 p.m. Address: Evergreen Hostel, Gartenfeldstraße 7, 54295 Trier, Germany.